So mine is coming along a bit differently than most. Not chasing top speed. Just hill climbing and getting into the backwoods with gear, because I LOVE using the wrong tool for the job. And I've shown up a few places up in the mountains that had guys out there on big Adventure Touring bikes just shaking their heads in disbelief. "Insane", "Nuts", "Must have a death wish" are a few of the things I've been told. Started as a brand new 2009 I bought last summer with .4 miles on the odo (now has about 3,600). 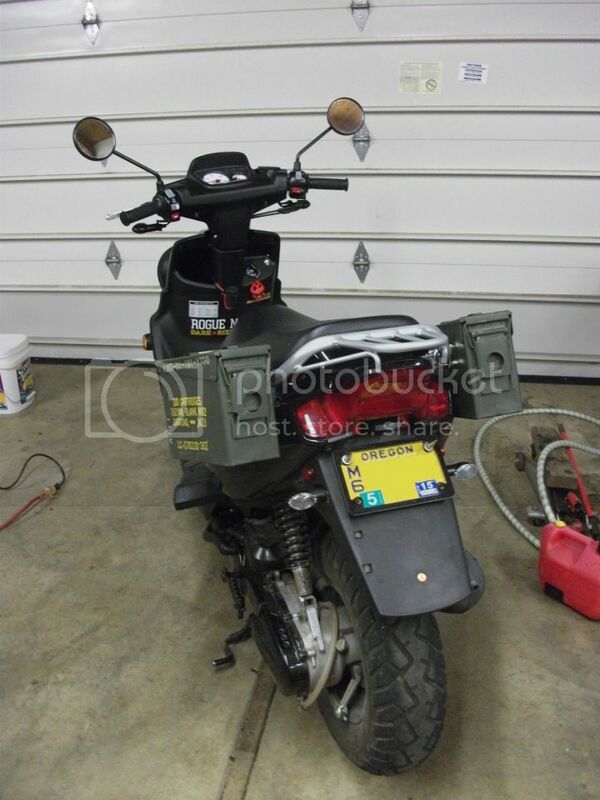 First thing I did when I got it home was tear it apart and do the throttle mod and dual headlight mod. Never had much use for warranty crap anyway, always end up fixing stuff under warranty myself. Then the triple brake light mod came. And I trimmed down the extra crap off the back end. Plugged the big hole left by the fender extension with a spent 7.62x54R round. Next I decided that I wanted a louder horn. So I stuffed a Wolo Bad Boy air horn up under the cowling. Just barely enough room under the ignition switch for it with a custom bracket. That is powered through a relay, tried it at first with the stock wiring and it blew the Zuma's fuse on the second blast of it. Being I like to ride off road and also wanted trans venting. I mounted a small computer fan in place of the stock horn (but slightly offset to avoid rain coming in through the vent) this funnels into a hose that runs to a 90 degree elbow epoxied into the front of the CVT cover. There are 3 vent holes I screened in at the top rear of the cover. That is wired to a toggle switch near the key. Seems to work well. Not as good as turning the CVT cover into swiss cheese, but better than sealed. I also added a 12v power port that is in about the same spot as the 2012 Zuma bag hook to power my GPS. I have had no battery issues so far with everything running. Eventually I put some 6.5g Dr. Pulley sliders in to get better climbing abilities. Worked great. And a Malossi torsion controller. Fast forward to recently and it got a TP 70cc kit with all the goodies you need to go along with it. 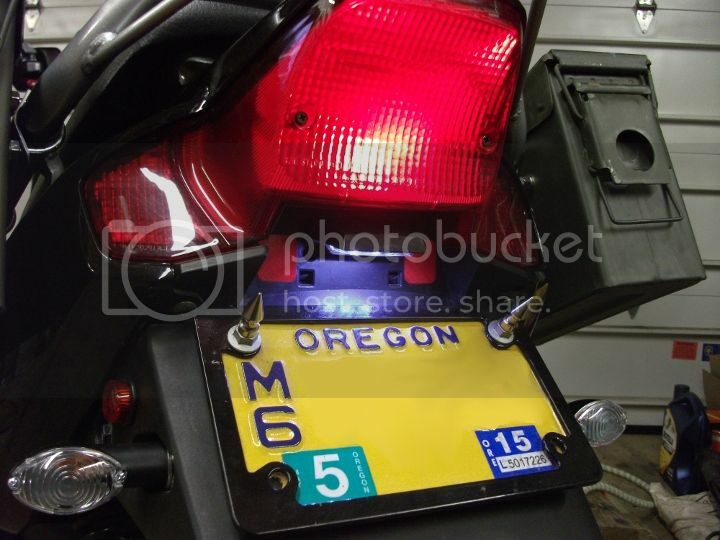 Also found a license plate light at the dealer that has angular lines and such so it fits the lines of the Zuma nicely. the big square turn signals always bothered me. Seemed like whenever I looked at it my eyes went right to the signals. So I found some at the Yamaha dealer that were cheap and fit nicely. For the front I just drilled out the hole bigger on the stock brackets and bent the tab down 90 degrees. Then today something I've been wanting to try out for a long time was finally put together. The ammo can side boxes. Fastened with some U-bolts and a foam rubber pad to protect the body on the front lower inside corner. Those will come in handy for hauling a few items on camping trips. On to a few pics. Don't really know how much I'll update this. For the time being I have it just how I want it. But I'm sure it'll get some things changed. I want to put a better fan on it by summer. Get a better clutch. Maybe a better variator. You know, the usual. Last edited by TeamCatFlap on Fri Jun 08, 2012 9:26 am, edited 2 times in total. Oh. And it also got a fork oil change to 15 weight. (I've read that 10w is stock) Got rid of a bit of bounce up front. Seems to stay hooked up on rough surfaces a bit better. I like it! And good for you for actually getting out there and putting some miles on it! I would have been riding it all winter, even went out and bought fancy rain gear and gloves. But we get too much frost and snow up here at the house, fun to dink around on in the driveway, not fun to try and get anywhere on. I may be moving down closer to Portland though in the near future. Then it'll see even more miles. Though it sees a lot of miles now because just to get to where I meet up with the club so we can go for a ride I've put on 30+ miles one way. I've never done a ride of less than 60 miles (the round trip to get to Portland and back). Except for the two times I just ran to Sandy for a beer run, those were about 14 mile round trips. Proly put a few hundred miles at least on it the last weekend of the month for Spring Scoot http://springscoot.com/ . That will be a good start to the season. I have a feeling I'll be seeing the odo turn over 10,000 by the end of summer. The club has some long rides planned (first camping trip is Portland to Bend via forest roads). We have this addiction where every ride has to be longer and more epic than the last. And has to be places where you really should not take 50cc scooters (everyone rides the smallest thing they got). Nice! It takes me a month to put 60 miles on! you're my new hero dude. i want to go on one of these long rides sometime! i already have a trip planned so im going to miss springscoot but maybe some other one. what about gas? any plans to fashion up a jerry can? theres another guy from portland on here and he modified his tank its quite cool. So far I've been carrying either a gallon or a two gallon on the floorboard between my feet. I made some brackets (basically rounded "L" brackets) and use longer screws for the battery cover. then just bungee it down. Even with some rougher off road it's worked fine. Though the 2 gallon needs a long bungee hooked to the front of the body running through the can handle to stabilize it. The 1 gallon rides great. I put sticky back foam rubber padding on the sides of the cans that touch the floorboard and such. I have looked into getting a 1 gallon Rotopax and was thinking of replacing one of the ammo cans with that. Gas on one side, storage on the other. But the whole setup would be in the $100 range once done. Currently looking at well sealed cans that can fit under the seat for rides where I don't need the space. There is a company that makes a 1 gallon wedge shaped one to fit in Harley saddle bags that would fit against the back wall of the under seat compartment good. My only concern is due to it being a plastic can in a plastic compartment is static. Of course making sure it's packed in well (I always have an old towel or two) and again using foam rubber padding where it might rub on the inside of the compartment is a must. And I'll just stick with the current setup that has served me well for the camping trips and whatnot. I'll proly do something better than just L brackets and bungees though in the long run. I thought about just having a bigger tank made or finding one that was bigger that would fit. But that would pretty much cut into the under seat storage area. I don't want to lose that. I've seen that Zuma on here with the bigger tank, I was tempted. 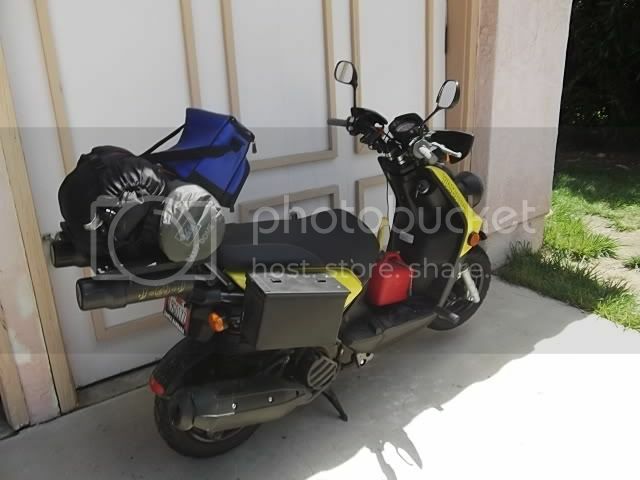 We have decided that for the longer camping rides a support vehicle will be used this year, we figure riding your small scooter all day with your main camping gear on board will be enough of an adventure . For the Hood River camping trip we had one show up that brought a cooler of beer and some firewood. But we did not have it following us. The coast camping trip to Pacific City we were on our own and had to make camp and then run to town for wood/beer after dropping our gear. For the planned trip out to Camp Sherman near Bend we will have a vehicle carrying extra gas along for the trip just in case. But that trip is dependent on when the snow melts out of the Cascades and if the roads we need to use are even open. the easy way happens to cut through the Warm Springs Indian Reservation so we can't use that route. We'll have to go down to Detroit Lake (I've already made that ride) and then go via a maze of forest roads to make our way east. I might recon it in a few months in the cage with the GPS tracking me to figure out if what I mapped is gonna work. And I'll be trying to remember to post up here when I know details of the big rides. I know jdubbya had some interest in trailering his Zuma down and going along on one of them. The Hood River camping trip over Lolo Pass. I love the Ammo boxes, Ive got a similar setup! if you are not using the inderseat storage you can make a extra gas tank. I do use my under seat storage. But would like to see more of the Moto-Zumas. It works well, and doesn't really scratch the frame. At least on my 125. Unfortunately, I laid the zuma down in December on some loose gravel. The Box saved me and the scooter from serious damage. For whatever reason, Ive got to tighten the U bolts every thousand miles or so. If I felt like removing the boxes again, I would double nut the U Bolts. Yeah being mine is on the rack it's a smaller tube/U-bolt. I actually have it resting at the bottom against the body panel with a 1/2" thick foam rubber pad protecting things. Seems solid, at least enough for my use. I figure I'll use them for lighter objects. I have the u-bolts double nutted which gave me the right amount of spacing as well so the box is right up against it all with washers to provide more surface area. Then on the inside it's washers and lock nuts. So essentially is triple nutted with the last being the locknut. Should stay tight, but I'll keep an eye on it. I might see if I can find some grade 8 bolts to replace the stock ones that hold the rack to the scoot just because as well. Not 100% sure on the quality/strength of the stock bolts. Good idea. I ended up using Wing nuts on the inside of the box, with the thinking that I could remove the boxes without any tools. Unfortunately, I didnt realize how much I had to torque the bolts down to make sure everything was snug. Any particular reason why you want a different fuel carrying setup? Ive got a 1.3 Gal can that fits perfectly on my floorboard. Im always looking for more range though. I'd like something that looks a bit more "set up" or hidden for certain rides. I do fine with the can on the floorboard as well most of the time. 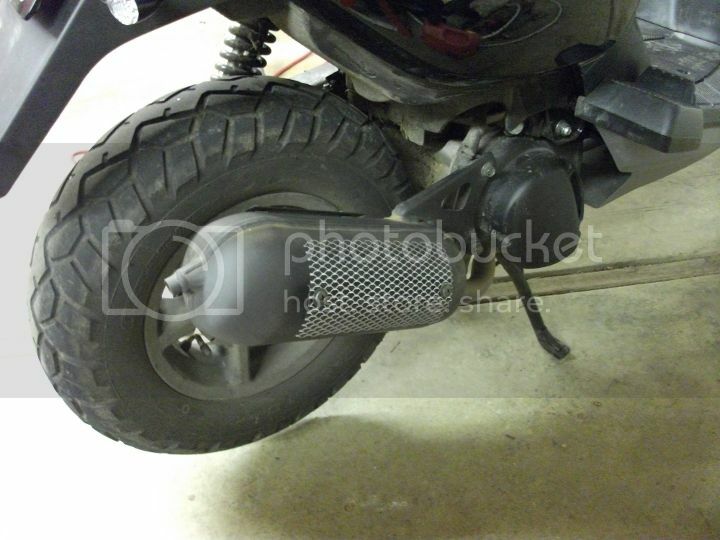 But with the big Spring Scoot rally coming up I want to get a can I can feel safe just throwing under the seat. I think I found one. See, I'm not sure how these guys do their rides. It's a vintage scooter club that puts on the event and most of the scoots will be old Vespas and Lambrettas (there are always a lot of Rucks too judging by the pics from last year). They do two longer distance rides, one Saturday and one Sunday. 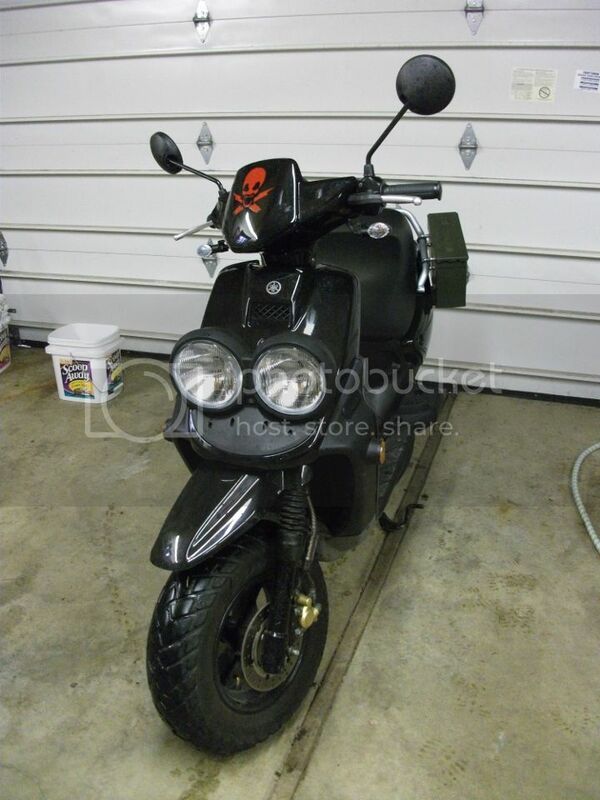 I get about 50mpg (more around town just cruising) when I'm romping on it a lot with the 70cc and the Zuma holds about 1.5g. I know an extra gallon will be just right. If these guys have longer range and are not into making gas station stops, I'd like to be able to top back off halfway through when we stop to stretch our legs. And not be that guy on his "mom's damn tupperware rental scooter" that has to stop for gas all the time (there is a bit of a class warfare in the scooter scene in Portland, but most are pretty cool about new scoots). But I don't want the can on the floorboard for the rides. And it'll give me options in the future. this Kolpin unit looks pretty decent, might even fit somewhere nice?